Mexican tortilla chips are a snack food made from corn tortillas that are cut into wedges, then fried until crisp. A serving of tortilla chips contains a significant amount of calories as well as important vitamins and minerals. According to the U.S. Department of Agriculture Nutrient Database, a 2-ounce serving of tortilla chips, or around 18 chips, contains 275 calories. Carbohydrates contribute the most at 150 calories per serving. Fats deliver 110 calories, while proteins offer 15 calories. 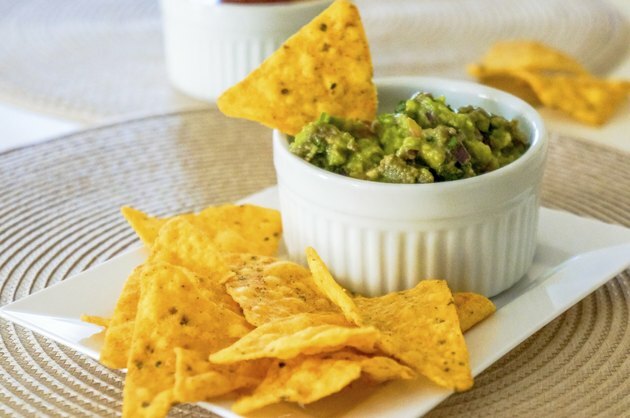 The USDA also states that around 7 percent of the recommended caloric intake required by the average adult each day is contained in a serving of tortilla chips. This percentage is calculated on a standard diet of 2,000 calories per day. A serving of Mexican tortilla chips weighs 56 grams. Within that serving, carbohydrates deliver 38 grams, while 12 grams are fat and 4 grams are protein. The rest consists of indigestible components, other nutrients and water. Tortilla chips also provide modest amounts of vitamins, such as thiamine, vitamin B6, riboflavin, niacin and pantothenic acid. Dietary minerals are also available in tortilla chips and include phosphorus, manganese, magnesium, calcium, iron, potassium, sodium, zinc, copper and selenium. Eaten in moderation, Mexican corn chips can provide a good source of carbohydrates, fats and other nutrients. According to the Harvard School of Public Health, whole grains, including corn, contain healthful carbohydrates. The school also states that foods, including corn chips -- if prepared with unsaturated oils free of trans fatty acids -- can also act as a healthy source of fat within the diet.